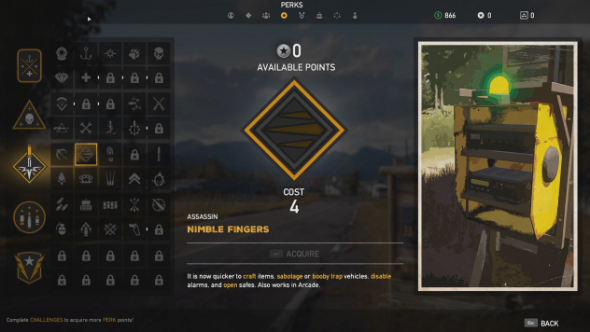 Far Cry 5 continues the series’s rich tradition of taking a bunch of genres and blending them up into an delicious sauce of mechanics and systems with its returning perks tree. 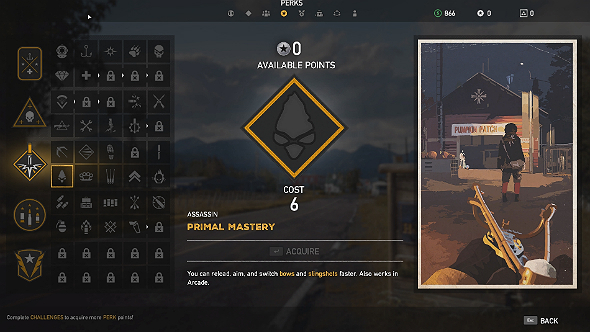 Far Cry 5 perks let you grow your rookie cop into bona fide killer of cultists. 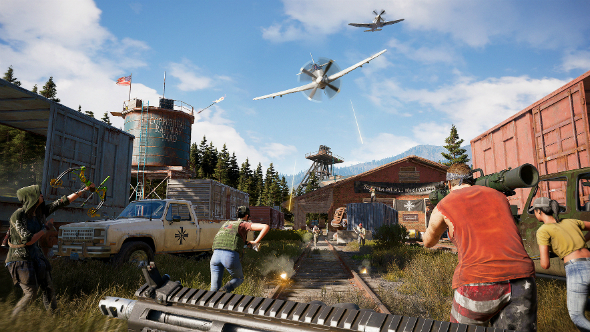 There are five distinct trees to grind through: Survivalist, Renegade, Assassin, Prepper, and Leader – it is up to you whether you want a well-rounded character with a small selection of Far Cry 5 perks from each section, or a focussed character who excels in one field, like traversal or equipment hoarding. Yet to pick up Ubi’s latest open world title? Check out our Far Cry 5 review. 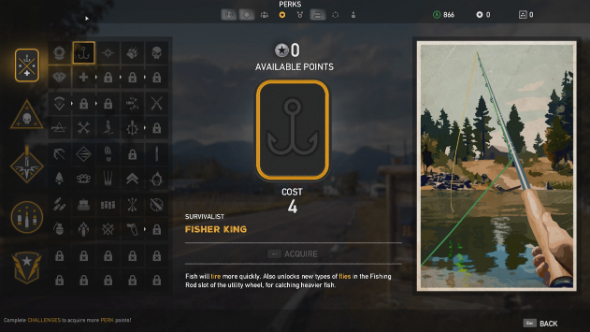 In Far Cry 5 you earn Perk Points in order to unlock new skills. These are rewarded through challenges that are divided into four categories: Assault, World, Guns For Hire, and Hunting. 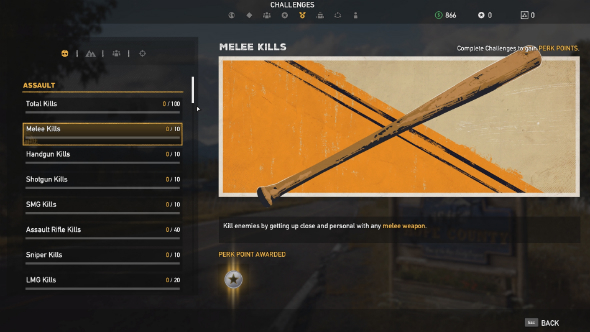 Different challenges offer different amount of Perk Points depending on their intended difficulty and you can track your progress in each challenge in the in-game menu. You can swim faster and hold your breath underwater longer. Also works in Arcade. Fish will tire more quickly. Also unlocks new types of flies in the Fishing Rod slot of the utility wheel for catching heavier fish. The Repair Torch is added to your utility wheel. Use it to open safes or to repair vehicles. Reduced animal attack damage. Predators (except Judges) prioritize nearby enemies over you. Prey animals flee less from you. Also works in Arcade. Craftable remote explosives, proximity explosive, molotovs, pipe bombs, sticky upgrades and special ammo are now available to buy at all shops. Double your reward from plants and animals. Your maximum health is increased to 150%. Your maximum health is increased to 200%. Your maximum health is increased to 250%. Your maximum health is increased to 300%. 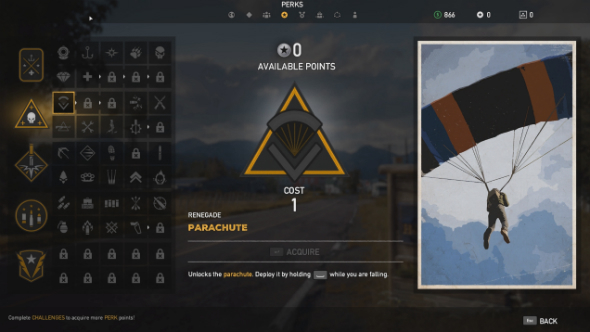 Unlocks the parachute. Deploy it by holding Space while you are falling. Unlocks the wingsuit. Use it by pressing Shift and switch between parachute and wingsuit in mid-flight allowing you to cover more distance. Unlocks the option to arrive by air drop when you fast travel to a location. Bullets will do more damage to vehicles. Works best with armor piercing ammo. So let ‘em have it! Also works in Arcade. Reload, aim, and switch SMGs and shotguns faster. Sway and bullet spread are reduced. Also works in Arcade. Reload, aim, and switch LMGs, launchers and the flamethrower faster. Sway and bullet spread are reduced. Also works in Arcade. All vehicles you drive will automatically repair themselves. Also works in Arcade. Reload, aim, and switch rifles and sniper rifles faster. Sway and bullet spread are reduced. Also works in Arcade. Approach a vehicle’s hood and hold E to set it on fire and make it explode 10 seconds later. Also works in Arcade. Approach a vehicle’s hood and hold Ctrl to make it explode on the next collision. Also works in Arcade. Unlocks the grapple tool. Find grapple spots in the world and use LMB and RMB to climb up and down quickly. It is now quicker to craft items, sabotage or booby trap vehicles, disable alarms, and open safes. Also works in Arcade. Move much faster while still staying crouched. Also works in Arcade. The amount of components needed to craft remote and proximity explosives is reduced by 50%. Unlocks chain, melee throw, and sidearm takedowns. Takedown range increased. You can reload, aim, and switch bows and slingshots faster. Also works in Arcade. Melee weapons are more sturdy. Reload, aim, and switch handguns and melee weapons faster. Sway and bullet spread are reduced. Also works in Arcade. Stealthily lockpick safes and doors that do not require a key card with E.
Throwback incoming projectiles like grenades or dynamite when you see MMB. Also works in Arcade. You make less noise walking, sprinting, and landing. Falling damage is reduced. Also works in Arcade. Carry more handguns ammo and melee weapons. Also works in Arcade. Carry more items in your inventory, including up to 5 medkits. Also works in Arcade. Carry more SMG and shotgun ammo. Also works in Arcade. Carry more normal, incendiary, and explosive arrows. Also works in Arcade. Carry more rifle and .50cal ammo. Also works in Arcade. Carry more explosive, throwing knives, and bait. Also works in Arcade. Carry more armor piercing, incendiary ammo, and special rocket launcher ammo. Also works in Arcade. Carry more LMG, flamethrower, rocket launcher, and grenade launcher ammo. Also works in Arcade. Carry a 3rd weapon of any type in your weapon wheel. Carry a 4th weapon of any type in your weapon wheel. Condition: Help Boomer at the Rae-Rae’s Pumpkin Farm in Holland Valley to unlock it as a Fang For Hire. Boomer returns faster after being injured. Condition: Help Sharky at the Moonflower Trailer Park in Henbane River to unlock him as a Gun For Hire. Sharky returns faster after being injured. Condition: Help Mable at the Peaches Taxidermy in Henbane River to unlock Peaches as a Fang For Hire. Peaches returns faster after being injured. Condition: Help Jess at the Baron Lumber Mill in Whitetail Mountains to unlock her as a Gun For Hire. Jess returns faster after being injured. Condition: Help Grace at the Lamb Of God Church in Holland Valleyto unlock her as a Gun For Hire. Grace returns faster after being injured. Condition: Help Hurk at the Fort Drubman in Whitetail Mountains to unlock him as a Gun For Hire. 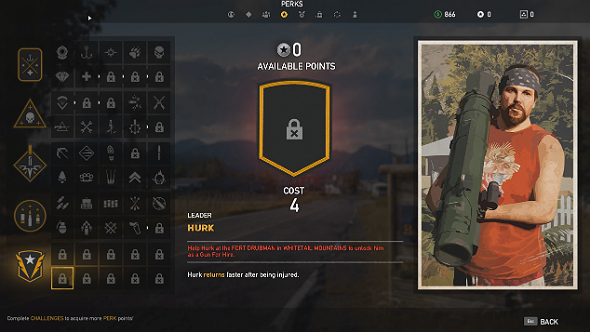 Hurk returns faster after being injured. Condition: Help Nick at the Rye’s And Son Aviation in Holland Valley to unlock him as a Gun For Hire. Nick Rye returns faster after being injured. Condition: Help Adelaide at the Drubman Marina in Henbane River to unlock her as a Gun For Hire. Adelaide returns faster after being injured. Condition: Help Wade at the F.A.N.G Center in Whitetail Mountains to unlock Cheeseburger as a Fang For Hire. Cheeseburger returns faster after being injured. Condition: 0/3 Unique specialist hired. Unlock an additional slot in your squad to let you play with two Guns For Hire in single player.